Back in March, a friend and I drove down to San Francisco for a Microsoft event. The subject of movies inevitably comes up during our road trips, and this time was no different. So at some point during the conversion the question came up as to had I seen There Will Be Blood yet, and I responded to the affirmative with an emphatic BORING! Soon I realized that I was thinking of another movie, 30 Days of Night , which is about vampires, and not There Will Be Blood , which is about an oil man in the early 20th century. Eventually, this movie made it onto my Netflix queue, so a few days ago I finally got to see this apparently popular and highly-liked film. However, my reaction is the same as it was from 30 Days of Night , which is BORING! I truly don't understand why everyone loves this movie so much. I found it to be fairly dull, with no clear direction as to where it was going, no clear antagonist, and no real struggles for our protagonist to overcome. 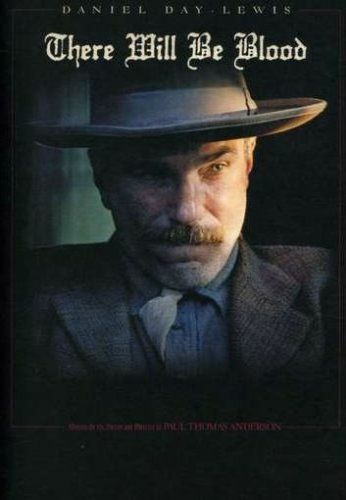 It did feel as if it was taking place back in the early 1900s, and I thought Daniel Day-Lewis played the character of Daniel Plainview to perfection, but those two things don't make a great movie. I want to be engrossed in the story. I want to care about the characters. I want movies to make me FEEL, not put me to sleep. The story is about a strong-willed guy named Daniel Plainview who at first is prospecting for gold... or at least I think that's what was going on in the beginning. There was like no dialog for the first five minutes of the film so I'm just going off of what I could see... and it was hard to make out details since everything was so dirty and dusty. But I think he was holding a rock with gold contained in it, so for the sake of argument lets just say that he was. Next thing I know some big metal thing is accidentally dropped into a vertical mine shaft, killing a guy who was down there, but more importantly puncturing the ground releasing thick, black oil. We flash forward a few years to find he is now an oil man... or at least claiming to be an oil man. I wasn't too sure if he was lying to try and get people to give him money to drill, or if he was trying to get land to drill, or if he was on the up-and-up. Whatever the case, he eventually does have pumps pulling oil from the ground. Okay, so then this teenage kid comes along and tells Mr. Plainview that he knows where there is land with oil that seeps out of the ground. Mr. Plainview pays him some money and the kid shows him where his home is (or was, as he is leaving home). Mr. Plainview and his child son visit the area, meeting the family under the pretense of wanting to quail hunt on their land. After discovering that there really is oil under the ground, they sit down with the dad and his other son, Eli Sunday, a religious fanatic that has his own church. So far, no real conflict has come up, so I'm thinking here is where it's going to happen. However, after a quick round of negotiation at the dinner table, a deal is struck. Mr. Plainview will give $5,000 to Eli's church. Okay, so I guess we'll have to wait a little longer for some kind of conflict or challenge. The oil platforms are built, as are new buildings for the town. Everything seems to be going great. Eli Sunday wants to bless the oil rig before it's turned on, and Mr. Plainview agrees, but then gives some speech dedicating it to Eli's sister, and on it goes. Not sure why he didn't have Eli come up to bless it, and not sure why Eli didn't speak up... I looked at my wife and she didn't really understand either. Okay... seems like that would have been a good place for some conflict or something, but I guess not. But not to worry, shortly after something cool does happen... the rig catches on fire. This looked fantastic on screen, with a huge fire shooting up into the sky. Unfortunately, nothing in the rest of the movie can overtake the awesomeness of this scene. Of course, not a whole lot happens there, just a giant, really cool looking fire that's taking place. Eventually people are able to push some carts with dynamite into the fire so that the ground blows up and collapse the gush of burning oil. During the start of this fire ordeal, Mr. Plainview's son was nearby the oil rig and is injured, loosing his hearing. This causes him to stop talking for some reason. I understand that it can be difficult to talk without being able to hear yourself, but that doesn't mean it's impossible. But whatever, it's not like the kid talked that much anyway. So far he has really been more of a prop than a character. Of course, now that he's deaf, he needs to start acting up, causing Mr. Plainview to send him away to some special school. I guess that could be considered a conflict... maybe? And then the movie keeps on going, with stuff that happens but doesn't really seem to mean much. And it goes and goes... I think it's like two and a half hours long. There is one more flash forward where his kid is grown up into a young man, and Eli comes back and has some final showdown with Mr. Plainview like the two were long time rivals... which I guess they were even though I never got that feeling. I know the two didn't like each other but that's about all I got out of it. And then it ends, which leaves both my wife and I wondering why this got such good reviews. Ah, but what about the extra features? I don't know. The disc we got only contained the movie from Netflix. I'm not sure if Netflix has the two-disc addition, but even if the do, they like to send the bonus discs separately for some reason, and after watching this movie, we really wouldn't like to waste a rental disc on the extra features.